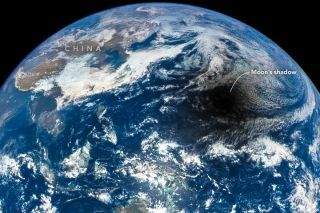 The moon's shadow, projected on Earth during a total solar eclipse, as seen from space. While the moon normally rises in the east and sets in the west, a total solar eclipse moves from west to east. Paul Sutter is an astrophysicist at The Ohio State University and the chief scientist at COSI Science Center. Sutter leads science-themed tours around the world at AstroTouring.com. Every day, the same routine. The sun rises in the east. Breakfast. Off to work. Work. Home from work. Dinner. The sun sets in the west. Repeat. It's a pattern familiar to everyone on Earth. For countless generations, we've relied on the regular cycles of the heavens to help demarcate our days. The normal, daily rising and setting of celestial objects isn't due to their own movement, but rather the rotation of Earth. As our planet spins on its axis, the heavens appear to rise up from the east, arch their way across the sky, and settle into the west. It's hard to blame our ancestors for assuming that Earth — which seemed very large and strong — was incapable of movement, with the ethereal denizens of the heavens gliding along their nested crystal spheres, giving humans our familiar, clockwork celestial movements. After centuries of serious work, people realized that Earth does indeed spin, and the motion of the sun, moon and stars is only apparent. But when it comes to solar eclipses we're faced with a new incongruity: why does the path of a solar eclipse start in the west and end in the east? The answer is simple, but it's not something we're accustomed to thinking about: the moon itself orbits Earth from west to east. In other words, if you could rocket up high above the North Pole, the moon would trace out a counterclockwise circle. But Earth rotates about 30 times for a single lunar orbit, so it's not something we normally notice. During a solar eclipse, the path of the moon's shadow must follow the motion of the moon itself — to the east. The solar eclipse is a wonderful opportunity to experience astronomy at its most basic: understanding the intricate dance of heavenly objects.